We’re excited to announce that Forrester has named Microsoft as a Leader in The Forrester Wave™: Big Data NoSQL, Q1 2019 based on their evaluation of Azure Cosmos DB. We believe Forrester’s findings validate the exceptional market momentum of Azure Cosmos DB and how happy our customers are with the product. Azure Cosmos DB is Microsoft's globally distributed, multi-model database service for mission-critical workloads. 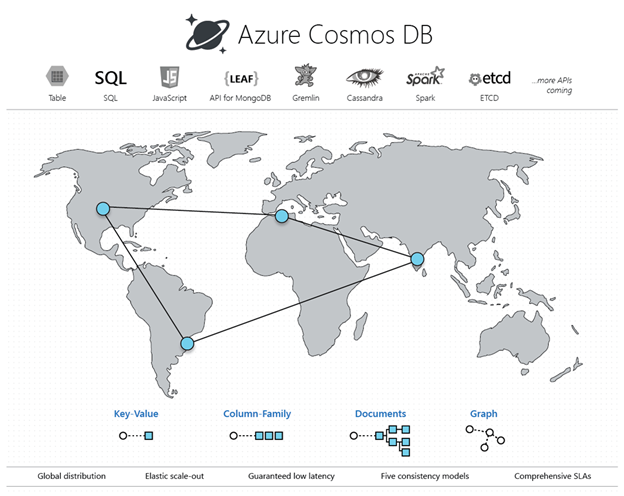 Azure Cosmos DB provides turnkey global distribution with unlimited endpoint scalability, elastic scaling of throughput (at multiple granularities, e.g., database, key-space, tables and collections) and storage worldwide, single-digit millisecond latencies at the 99th percentile, five well-defined consistency models, and guaranteed high availability, all backed by the industry-leading comprehensive SLAs. Azure Cosmos DB automatically indexes all data without requiring developers to deal with schema or index management. It is a multi-model service, which natively supports document, key-value, graph, and column-family data models. As a natively born in the cloud service, Azure Cosmos DB is carefully engineered with multitenancy and global distribution from the ground up. As a foundational service in Azure, Azure Cosmos DB is ubiquitous, running in all public regions, DoD and sovereign clouds, with industry-leading compliance certification list, enterprise grade security – all without any extra cost. Azure Cosmos DB’s unique approach of providing wire protocol compatible APIs for the popular open source-databases ensures that you can continue to use Azure Cosmos DB in a cloud-agnostic manner while still leveraging a robust database platform natively designed for the cloud. You get the flexibility to run your Cassandra, Gremlin, MongoDB apps fully managed with no vendor lock-in. While Azure Cosmos DB exposes APIs for the popular open source databases, it does not rely on the implementations of those databases for realizing the semantics of the corresponding APIs. Forrester notes Azure Cosmos DB’s global availability across all Azure regions and how customers use it for operational apps, real-time analytics, streaming analytics and Internet-of-Things (IoT) analytics. Azure Cosmos DB powers many worldwide enterprises and Microsoft services such as XBox, Skype, Teams, Azure, Office 365, and LinkedIn. To fulfill their vision, in addition to operational data processing, organizations using Azure Cosmos DB increasingly invest in artificial intelligence (AI) and machine learning (ML) running on top of globally-distributed data in Azure Cosmos DB. Azure Cosmos DB enables customers to seamlessly build, deploy, and operate low latency machine learning solutions on the planet scale data. The deep integration with Spark and Azure Cosmos DB enables the end-to-end ML workflow - managing, training and inferencing of machine learning models on top of multi-model globally-distributed data for time series forecasting, deep learning, predictive analytics, fraud detection and many other use-cases. We are committed to making Azure Cosmos DB the best globally distributed database for all businesses and modern applications. With Azure Cosmos DB, we believe that you will be able to write amazingly powerful, intelligent, modern apps and transform the world. If you are using our service, please feel free to reach out to us at AskCosmosDB@microsoft.com any time. If you are not yet using Azure Cosmos DB, you can try Azure Cosmos DB for free today, no sign up or credit card is required. If you need any help or have questions or feedback, please reach out to us any time. For the latest Azure Cosmos DB news and features, please stay up-to-date by following us on Twitter #CosmosDB, @AzureCosmosDB. We look forward to see what you will build with Azure Cosmos DB! Download the full Forrester report and learn more about Azure Cosmos DB.